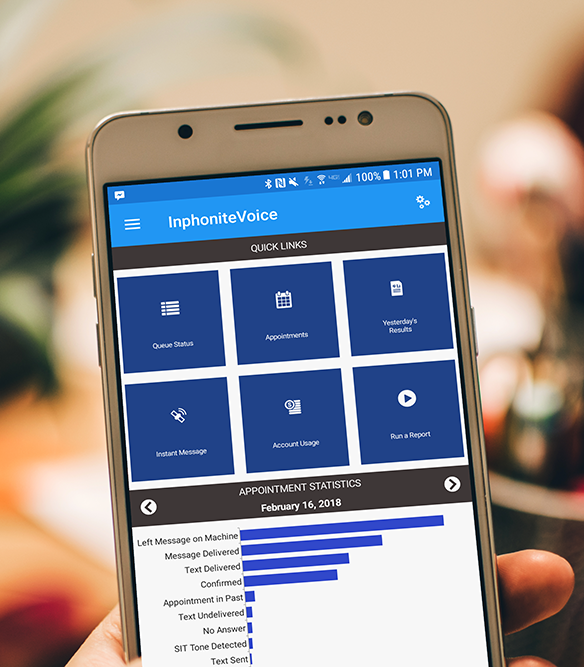 Access InphoniteVoice from anywhere with this cloud-based version of our innovative reminder software. The InphoniteVoice SaaS messaging solution is unrivaled in its ease of use. SaaS is a cloud-based service that requires no hardware and uses credits to send messages. Credits can be used by InphoniteVoice SaaS to deliver calls, texts, and emails. We offer three monthly credit bundle options for you to choose from depending on your needs and how many reminders you intend to send each month. No more renting a number to send text messages. We can enable your existing business phone number to send SMS messages at no additional cost to you. Add a personal touch to your text reminders. Create beautiful TextCards with graphics like your picture and logo. IV SaaS will automatically determine if a number is a cellphone or a landline and send the correct message type every time. Now you can access your IV SaaS account from your phone.